This 'Video' tab allows the user to set Sound, Logo and Video/Audio codec. Record/Stop Hotkey: The hotkey for the 'Record/Stop' functions can be set. Pause Hotkey: The hotkey for the 'Pause' function can be set. Show mouse cursor: If this option is checked, the mouse cursor will be shown in the video capture. Add mouse click effects: If this option is checked, the recorded video will have the mouse click effects/animation. Add webcam overlay: If this option is checked, the webcam stream is recorded and merged within the main video. Record Settings: The 'Settings' button under the 'Record' option helps make a choice regarding whether to record the sound and whether to add a logo/webcam. Format Settings: The 'Settings' button under the 'Format' option allows the setting of the format of the video that will be recorded. Record Sound: If the 'Record sound' option is checked, the sound will be captured with the video. Save audio tracks while recording (.wav): If this option is checked, audio is saved separately as a .wav file. To get audio tracks as a .mp3 file, start Bandicut, and check the "Extract audio tracks (.mp3)" option. Primary Sound Device: This drop-down menu allows the user to select the Primary Sound Device. Secondary Sound Device: This drop-down menu allows the user to select the Secondary Sound Device. If the microphone is selected, the volume slider will be shown. Windows XP won't allow the user to separate audio files. Two Sound Mixing: This option allows the user to mix the 'Primary Sound Device' and the 'Secondary Sound Device' into one audio track. This Webcam tab allows the user to add the webcam stream to the video that will be recorded (Picture-in-Picture, Video-in-Video). 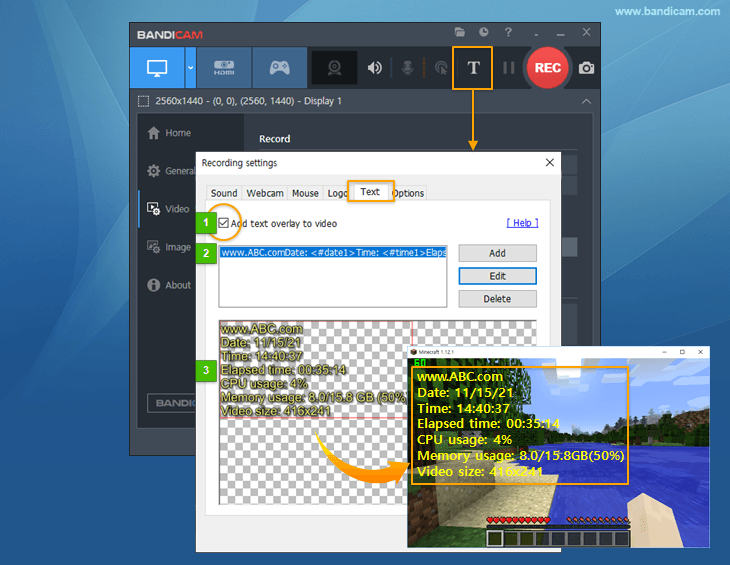 Add webcam overlay to video: This option allows the user to add the webcam stream to the main video. Webcam: This option allows the user to select the available webcam device. Format: This option allows the user to select the video size, FPS and color space. Chroma Key, Advanced settings: This option allows the user to use Chroma Key or set the size and position of the webcam screen. Preview webcam on screen: This option allows the user to preview the webcam screen while recording. Enable preview toggle hotkey: You can turn on/off the webcam preview screen while recording. If your webcam supports 4:3 and 16:9 aspect ratios, Bandicam records it as 4:3. If your webcam only supports 16:9 aspect ratio, Bandicam records it as 16:9. Add mouse click effect: If this option is checked, the recorded video will have the mouse click effects. Add mouse highlight effect: If this option is checked, the recorded video will have the mouse highlight (halo) effects. 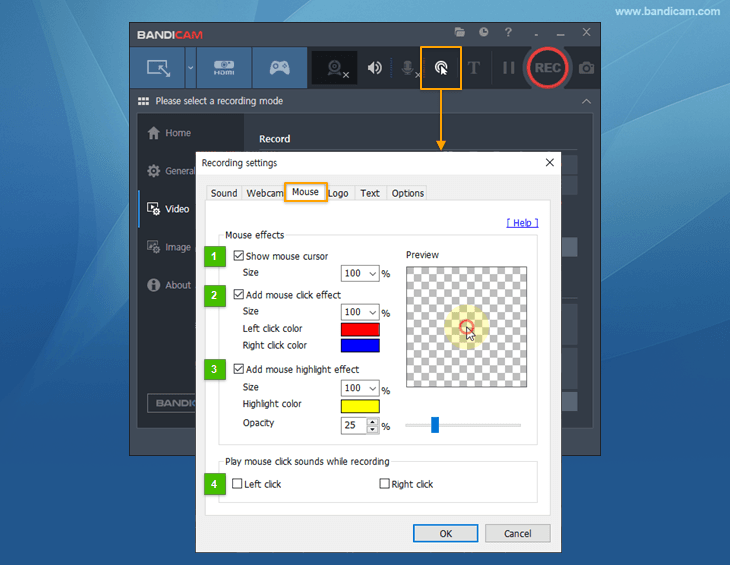 Play mouse click sounds while recording: If this option is checked, the recorded video will have the mouse click sounds. This Logo tab allows the user to add the logo to the video that will be recorded. Add logo to video: This option allows the user to add a certain logo to the streaming video that is being recorded. Setting - Image: This option allows the user to select the logo image. If this option is checked, up to 10 texts can be added to the streaming video that is being recorded. 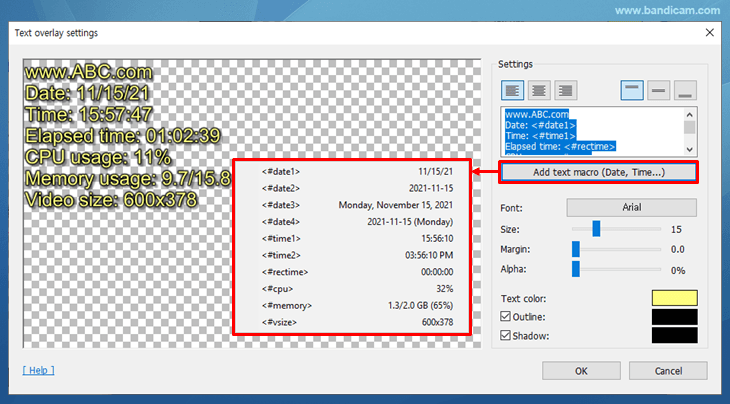 The user can set font, size, margin, alpha, outline and shadow at the Text overlay settings window . This area allows the user to preview the position of the text overlay. Recording priority: [Normal/High/Highest] - Higher priority may reduce dropped frames. Play sound effects when started or stopped: This option allows the user to hear sound effects when started or stopped. Show countdown timer before recording begins: If this option is checked, the recording will be started in 3 seconds (3, 2, 1...) in Screen Recording Mode. Use enhanced capture method (faster, Windows 8 or above): If this option is checked, the recording performance of screen capture will be improved in Windows 8 or above. The 'Presets' button allows for quick selection of often used format settings. 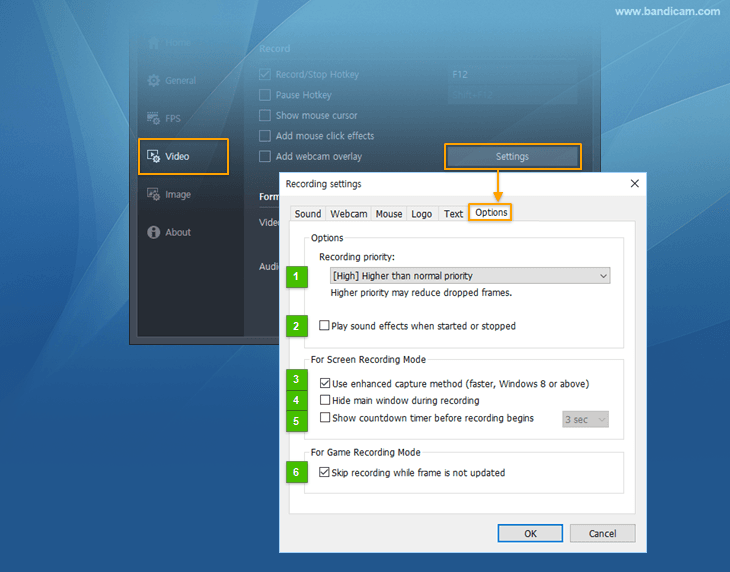 The Format Settings window for Video allows the user to change the Video Size, FPS, Codec, Bitrate and Quality. The .mp4 container is available in Bandicam 2.1.0 and Windows 7, 8 or 10. 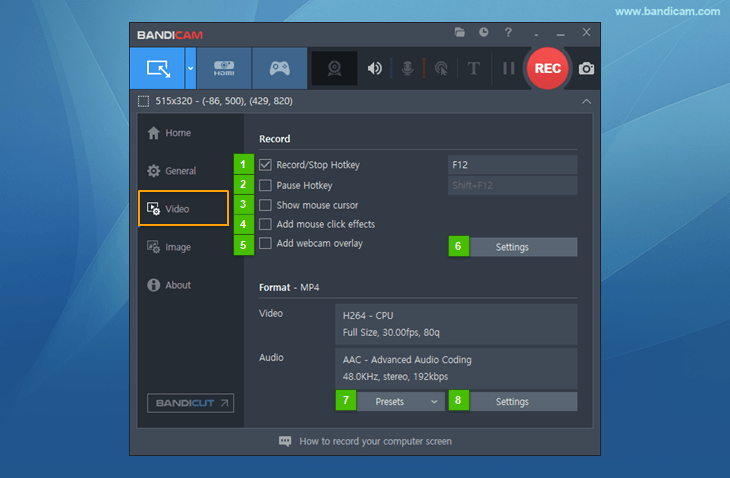 AVI : The video file recorded by Bandicam is saved as an .avi file. MP4 : The video file recorded by Bandicam is saved as an .mp4 file. Full Size: The recording target will be saved in the original size. For example, if your recording target is 1024*768, the recorded video size will be 1024*768. Half Size: The recording target will be saved in half the size. For example, if your recording target is 1024*768, the recorded video size will be 512*384. Fit Width: If you set the width to 1024, the width of the recorded video will always be 1024. 320*240: The recording target will be saved in 320*240. For example, if your recording target is 1024*768, the recorded video will be 320*240. Custom: You can set the recording video size by yourself. FPS (Frames per second): With a higher FPS, you can get a more natural video (smooth motion). Normally, 30 FPS is good for recording video. Regularly, movies are 24 FPS and TV is 30 FPS. [VFR/CFR]: If you click the [...] button, you can choose the 'VFR or CFR' option. Codecs are a kind of video compression format. If you use a higher compression codec, you can get a small video file, but the video quality might be poor. HEVC: HEVC (H.265) is better at compression (The file size of HEVC is smaller than H.264 if the video quality is the same). Some media players don't support HEVC. HEVC uses more CPU usage. H.264: H.264 is one of the most popular codecs for the recording, compression, and distribution of high definition video. This codec will allow you to record the target in high speed and high compression ratio with an excellent quality. XVID: XVID is used for portable devices like the Galaxy S mobile phone. The XVID codec offers a good quality of video and uses less CPU time than MPEG-1. MPEG-1: MPEG-1 is the most widely compatible lossy audio/video format in the world. Most media players and YouTube support the MPEG-1 codec. The MPEG-1 codec offers a good quality of video and uses much less CPU than other codecs. Motion JPEG: Motion JPEG (M-JPEG) is an informal name for a class of video formats. It is compressed as JPEG images. If you want to edit the recorded streaming video in Sony Vegas (or Adobe Premiere Editor), you should choose this codec. The file size is quite big. External Codec: If you click the [...] button, you can use the VFW (Video for Windows) codec. VBR/CBR: VBR (Variable bitrate) allows a higher bitrate to be allocated to the more complex segments of media files while less space is allocated to less complex segments. If you check VBR, you can get a better quality-to-space ratio compared to a CBR (Constant bitrate) file of the same data. You can choose the recorded video quality. If you have a good performance computer and want to get the best quality video, select 100 (%). If you have a bad performance computer and want to reduce the recording lag, select 50 (%). 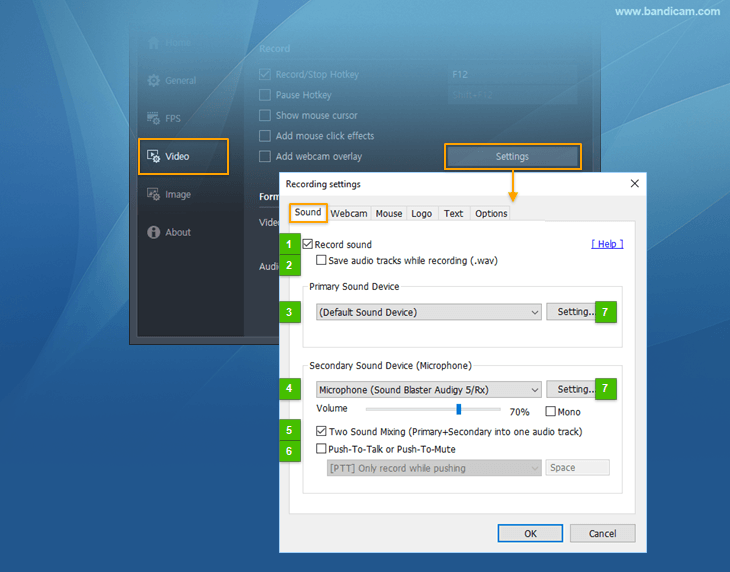 The Format Settings window for Audio allows the user to change the Audio Channels, Frequency, Codec and Bitrate. MP2: (MPEG-1 L2, MPEG-1 Audio Layer II) is a lossy audio compression format and it is a dominant standard for audio broadcasting. Most media players and YouTube support the MP2 audio format. MP3: (MPEG-1 L3, MPEG-1 Audio Layer III) is one of the most popular audio codecs. MP3 files use lossy compression, which compacts audio drastically. MP3 is generally more efficient than MP2 at the same bitrate. To choose the best audio codec, visit this page. Bitrate represents the amount of information. Stereo: Stereo sound is usually achieved by using two or more independent audio channels. Stereo sound is used in most entertainment applications. Mono: Mono sound is single-channel. It is used for radiotelephone communications, telephone networks, etc. 44,100 Hz: Used for Audio CDs, also most commonly used with MPEG-1 audio (VCD, SVCD, MP3). 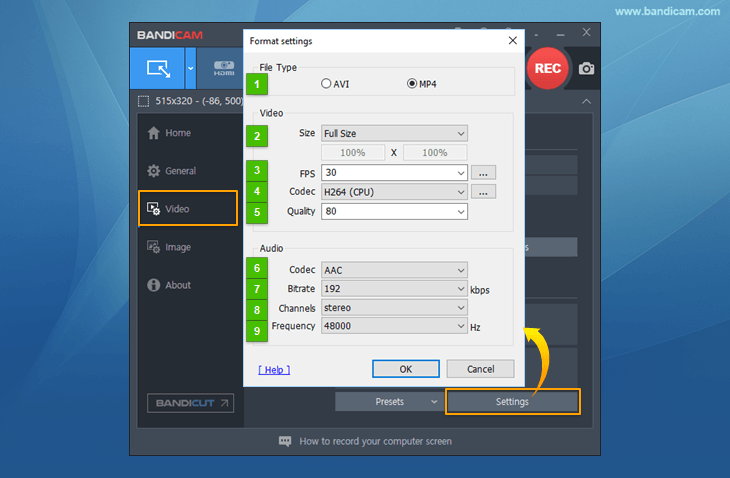 How to edit the recorded streaming video.